Kayaks Hot, Canoes Not In Maine, outdoor enthusiasts are tossing aside their canoes for kayaks. Youth Radio's Molly Adams reports that many paddlers are now opting for the independence of kayaks over the traditional family-sized canoe. In Maine, outdoor enthusiasts are tossing aside the iconic canoe for the more modern kayak. 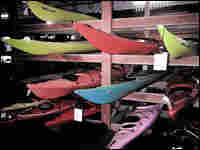 Retailers say that kayaks are in demand, outselling canoes 3-to-1. The Old Town, Maine fixture "Old Town Canoes" has even gone so far as to change its name to "Old Town Canoes and Kayaks." Youth Radio's Molly Adams takes a kayak tour to try and figure out why kayaks are turning canoes into little more than "an object of nostalgic lust." Kids these days have a lot to do with it, she finds.